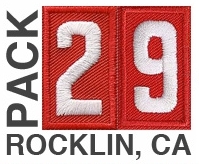 Chartered by the Lions Club of Rocklin, Pack 29 has been a part of the Rocklin community since 1949. The Pack has a history of over 65 years of service to the youth of Rocklin, including hosting the annual City of Rocklin Jubilee Pancake Breakfast for many years. We now are hosting the Pancake Breakfast for the Hot Chili & Cool Cars event. Pack 29 accepts new and transfer Cub Scouts any time during our year round program.